With these beautiful black contact lenses your eyes will gain a mysterious and mesmerising look that you always wanted to have in order to look sexier and more fashionable. 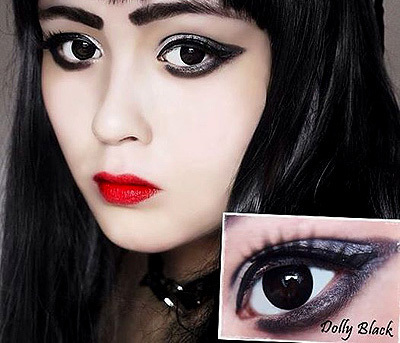 ColourVue Big Eyes Dolly Black will make your eyes look like doll's eyes - big and deeply black. Thanks to a special ring around the colored area of the lens, they provide an amazing eye enlargement. Due to the fact that ColourVue Big Eyes Dolly Black contacts have such a universal color and are so striking, they can be used on a daily basis by anybody who wants to change their looks as well as for special occasions as a part of a costume. Try them out now!